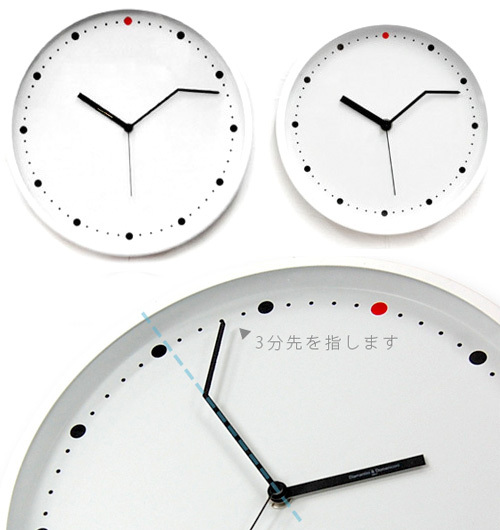 On-Time Wall Clock Gives You Three Extra Minutes | OhGizmo! If you agree to play along, this clock from Italian clock maker Diamantini & Domeniconi can perpetually give you 3 extra minutes throughout your day. Granting the wish of anyone who’s ever wanted “just a few more minutes!” to get something done. As clocks go it’s got a fairly mundane design, with dots representing the numbers that usually appear around the circumference of the face. But what makes it stand out is the minute hand which bends at the end, making it point 3 minutes ahead. You’ll have to train yourself to look at where the crooked hand is actually pointing for it to be of any use to you. Not where the minute hand naturally directs your eye. But if you manage to fool yourself you may never be late for a meeting again. Why not just set your clock three minutes ahead? Same thing, except you dont have to remind yourself to be fooled.